Customers may exchange their saved Nectar points at participating stores for a Nectar Double Up voucher to be redeemed in store with any of 11 participating departments only: Tu Clothing, Seasonal, Electricals, Entertainment, Homeware, Toys, Skincare, Fragrance, Cosmetics, Gifting and Taste the Difference: Wine, Champagne, Sparkling, Sherry & Port. Standard exclusions apply. Double Up vouchers will be issued online between 29 October - 4 November and instore between 5 –18 November but can only be redeemed instore 12 - 18 November 2018. Not available through Groceries Online, or in Locals, Centrals, Petrol Filling Stations or Concessions. 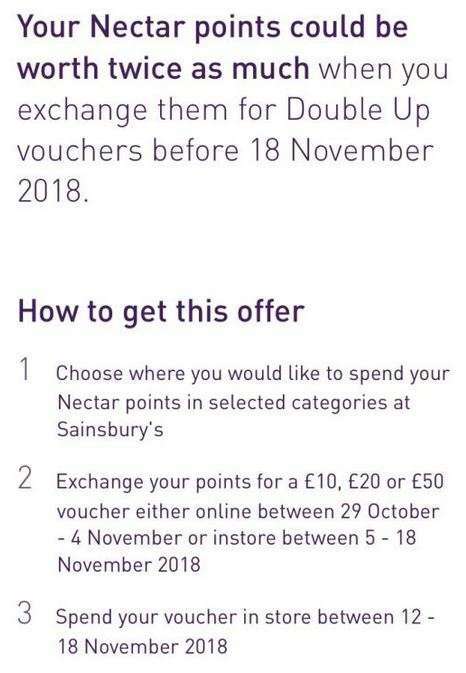 Minimum exchange value 1,000 Nectar points (£10 voucher). Maximum exchange value 20,000 Nectar points (£200 in vouchers). Vouchers valid until 18 November 2018. Vouchers must be redeemed by this date when they will expire. Vouchers are non-refundable. Full terms and conditions apply, please see Sainburys.co.uk/DoubleUp. 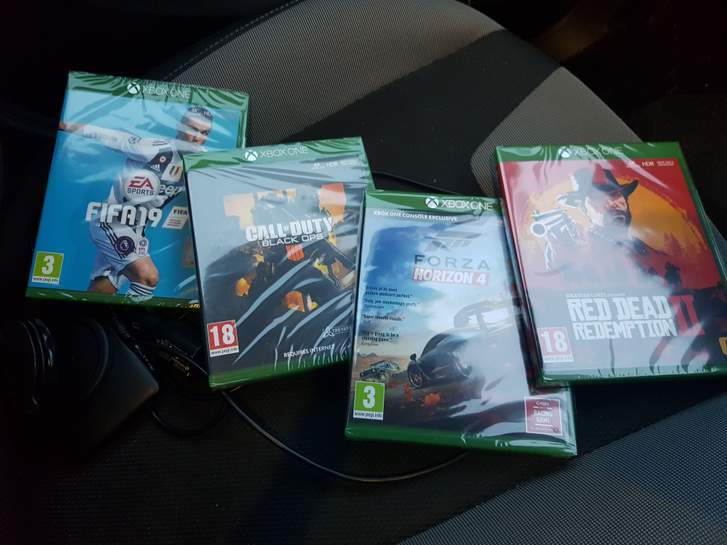 Multiple vouchers spent at once (3x £50 1x £20 1x £10) with no issues, teenage boys Christmas done. seems they've upped the max voucher? I thought it was £40 max last year? Exchange your points for a £10, £20 or £50 voucherseems they've upped the m …Exchange your points for a £10, £20 or £50 voucherseems they've upped the max voucher? I thought it was £40 max last year? That’s right it’s always been a maximum of £40. I’m trying to find more info as I got these details from the Nectar app. there isnt much more than that on the main nectar site either. So you can't use them with the 25% off tu on 29th in-store? If you read the T&Cs the vouchers are £50 But doesn't say you can't get four £50 vouchers for say electricals... so technically £200 off an Xbox or similar? Will be interesting to see what the full t&c’s are when Sainsbury’s update their site. I’ll update the info as soon as more becomes available. That’s right it’s always been a maximum of £40. I’m trying to find more inf …That’s right it’s always been a maximum of £40. I’m trying to find more info as I got these details from the Nectar app. Is it a total of £40 that you can get in vouchers using the double or in one transaction? 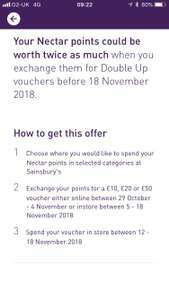 I have never used nectar points for buying/redeeming anything - just have a big stash of points accumulated through various Amex cards and other Nectar promotions - so pardon my ignorance here. I got so excited on another misleading thread when someone posted that we could use both. Is it a total of £40 that you can get in vouchers using the double or in …Is it a total of £40 that you can get in vouchers using the double or in one transaction? 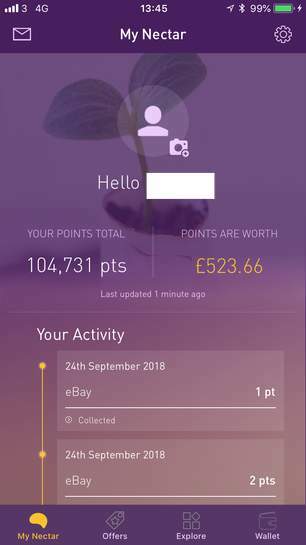 I have never used nectar points for buying/redeeming anything - just have a big stash of points accumulated through various Amex cards and other Nectar promotions - so pardon my ignorance here. In previous years it’s been a maximum of £40 (£20 doubled) to be used in a transaction for your chosen department. I know that some were able to get £40 worth of vouchers for say TU then double up another voucher to buy more from TU although the t&c’s did state you could only use a voucher for a department once. You could double up to a maximum of £40 for more than one department though if you had enough points of course. In previous years it’s been a maximum of £40 (£20 doubled) to be used in a …In previous years it’s been a maximum of £40 (£20 doubled) to be used in a transaction for your chosen department. I know that some were able to get £40 worth of vouchers for say TU then double up another voucher to buy more from TU although the t&c’s did state you could only use a voucher for a department once. You could double up to a maximum of £40 for more than one department though if you had enough points of course. You have: 104,728 pts worth at least: £523.64 - embarrassed even to be sitting on these many points - as I can never find a good return on these - earlier used them for swim vouchers to the local clubs but they have stopped them. So are you saying I could convert £40 worth of vouchers in grocery, then the same for TUI and then on electronics and so on? You have: 104,728 pts worth at least: £523.64 - embarrassed even to be …You have: 104,728 pts worth at least: £523.64 - embarrassed even to be sitting on these many points - as I can never find a good return on these - earlier used them for swim vouchers to the local clubs but they have stopped them.So are you saying I could convert £40 worth of vouchers in grocery, then the same for TUI and then on electronics and so on? Wow that’s a lot of points. Grocery is excluded from the double up unfortunately, they usually have their taste the difference wine in the offer though. Well this year it’s saying you can covert vouchers to a maximum value of £50 but in previous years it was a maximum of doubling £20 into £40 but you could use £40 vouchers in TU and in other departments such as Electrical yes. It’s all a bit vague just now as Sainsbury’s haven’t published the full details themselves yet. Not surprised it's £50 now. New releases are that and more. FIFA was I think £52. i got nectar points on a new car from Ford while that was still going and collect them on AMEX cards. I’ve used them on the vue cinema deal a bunch of times when it was worth more and some Cafe Nero drinks and the ebay points offers. They otherwise literally only get spent in the pre-Christmas double-up. I’ve never seen any issues with the Taste The Difference drinks stock levels. Last year there was a big TU sale on at the same time as double-up. I go to multiple stores and or return on another day, never been limited. I know in the past there have been TU clothes on sale around the same time as the double up so maybe that’s what the person got mixed up with? I know in the past there have been TU clothes on sale around the same time …I know in the past there have been TU clothes on sale around the same time as the double up so maybe that’s what the person got mixed up with? No. Someone posted this last week or so. They posted the 25%off tu and also claimed they had info regarding the double up. The thing is iv told people to go on 26th and now I have to tell them it was a lie . No. Someone posted this last week or so. They posted the 25%off tu and …No. Someone posted this last week or so. They posted the 25%off tu and also claimed they had info regarding the double up. The thing is iv told people to go on 26th and now I have to tell them it was a lie . Eek! I did see info floating around somewhere that it would be October which I found odd as it is usually November. Not surprised it's £50 now. New releases are that and more. FIFA was I …Not surprised it's £50 now. New releases are that and more. FIFA was I think £52. Tu Clothing, Seasonal, Electricals, Entertainment, Homeware, Toys, Skincare, Fragrance, Cosmetics, Gifting and Taste the Difference: Wine, Champagne, Sparkling, Sherry & Port. As I said its mostly from promotion points when taking out the Nectar Amex card and points accruing earlier from British Gas - plus the fact I have hardly redeemed it. I posted the 25% off TU, but I never mentioned the double up as I didn't have that information. Other members replied with rumours of the double up, but stated that it wasn't official/confirmed. Guaranteed Scotland will be shafted this year on the wine and port double up. If I only have £.2.50 in points, there is no double up for them?